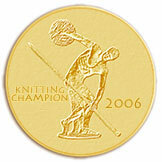 Well, there we are, the Yarn Harlot has announced the closing ceremony for the Knitting Olympics and Franklin has designed the medal, which comes in just the one variety - gold. In the end, over 4000 knitters took part, in teams from all over the world. Quite incredible! Team GB did some wonderful work and much fun was had all round. Certificates were issued too! Wow!